I get a lot of queries from readers about how the banking system operates. One recurring theme relates to the role of deposits in the banking system. Mainstream economic theory considers banks to be institutions that take in deposits which then provides them with the funds to on-lend at a profit. Accordingly, the ability of private banks to lend is considered to be constrained by the reserves they hold. While students find it hard to think outside of this construction, the reality is very different. Banks do not operate in this way. From the perspective of Modern Monetary Theory (MMT) private bank lending is unconstrained by the quantity of reserves the bank holds at any point in time. We say that loans create deposits. So then what is the role of deposits in MMT. That is the topic for today. I am deliberately simplifying to get the essential understanding across. It might sound bad but the decision was expected and inconsequential given that the Australian government foolishly will guarantee any wholesale debt that the big 4 encumber themselves with. During the early days of the recent crisis, the Australian banks encountered very severe funding difficulties as international wholesale markets froze and the Australian Government guarantee quickly freed things up and prevented any major escalation of the crisis in this country. 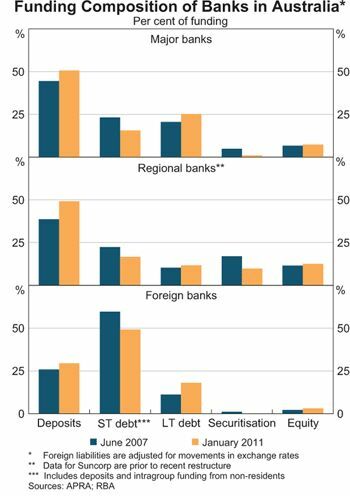 Moody’s also noted that in the period after the crisis, Australian banks reduced their reliance on foreign debt and shifted more to domestic deposits as a source of funding. In part, the deposits came from the corporate sector which was intent on reducing its indebtedness. The issue then is that as economic activity picks up, firms will once again enter credit markets and will have less “cash” available to offer as fixed term deposits. Today’s ABS data – Private New Capital Expenditure and Expected Expenditure – for March 2011, shows strong investment intentions are forming to support the commodity price boom in mining. This will be good news for the economy and will ensure we continue to grow but it also means that the banks will once again have to increasingly rely on offshore funding to maintain the growth of loans they desire. The whole show gets tenuous of-course if the terms of trade moderate which is highly possible given the tightening of monetary policy in China. All of this sounds like deposits are required for banks to grow loans and if they cannot get deposits then they have to borrow abroad (arbitraging international interest rate differentials) to maintain their desired growth in credit creation. Intuition is not always a very good guide. Question: Does MMT therefore deny that deposits fund loans? Answer: Yes. Question: Please explain? At the heart of the misunderstandings that abound in this area of economics is the mainstream macroeconomics textbook concept of the money multiplier. This is a core part of mainstream macroeconomic theory which students are taught and claims to “explain” the way banks create money and the way in which the central bank influences monetary aggregates. It is a profoundly difficult concept to eliminate from one’s memory bank once a student has learnd it. There are several problems. First, the money multiplier is not an accurate depiction of the way banks operate in a modern monetary economy characterised by a fiat currency and a flexible exchange rate. Second, the policy implications that stem from this erroneous depiction of banking lead to prescriptions that are very profoundly biased towards excessive tight fiscal and monetary policy. Much of the mis-conceived views about the relationship between budget deficits and inflation stem, more or less, from the idea that a central bank that ultimately “monetises” the deficit will generate hyperinflation. In the present policy debate, discussions about quantitative easing (erroneously referred to as “printing” money – so “flooding the economy with money”) also come back to the flawed depiction of central bank-private bank relationships which are grounded in the money multiplier concept. The textbooks will tell you that the money multiplier m transmits changes in the so-called monetary base (MB) (the sum of bank reserves and currency at issue) into changes in the money supply (M). Students then labour through algebra of varying complexity depending on their level of study (the money multipluer keeps appearing throughout a standard undergraduate-post-graduate sequence) to derive the m, which is most simply expressed as the inverse of the required reserve ratio. So if the central bank told private banks that they had to keep 10 per cent of total deposits as reserves then the required reserve ratio (RRR) would be 0.10 and m would equal 1/0.10 = 10. More complicated formulae are derived when you consider that people also will want to hold some of their deposits as cash. But these complications do not add anything to the story. And so on until the loans become so small that they dissolve to zero. This example is what the mainstream textbooks call a fractional-reserve banking system and it purports to explain how banks create money. Many nations do not use reserve requirements which are just devices to smooth out variations in overnight bank interest rates and do nothing to constrain lending. Other nations achieve the same low variability in the spread between what the central bank charges the banks for reserves and what the overnight interbank market rate for loans is by offering some return on excess reserves held with the central bank. Most central banks at present are now offering some “support rate” to private banks on overnight reserves they hold with the central bank. So the existence of reserve requirements or not is largely irrelevant for the story. Please read my blog – 100-percent reserve banking and state banks – for more discussion on this point. Underlying the narrative is a view of banks. They are conceived to be financial intermediaries who desire to maximise profits and take in deposits to build up reserves so that they can then on-lend the deposits at a higher rate. If the bank doesn’t have “reserves” it cannot lend – so goes the story. So banks first of all take deposits to get funds which they can then on-lend. But prudential regulations require they keep a little in reserve. So we get this credit creation process ballooning out due to the fractional reserve requirements. However, the way banks actually operate is nothing like this depiction. They certainly seek to maximise return to their shareholders. In pursuing that charter, they seek to attract credit-worthy customers to which they can loan funds to and thereby make profit. What constitutes credit-worthiness varies over the business cycle and so lending standards become more lax at boom times as banks chase market share. At present the lending standards are higher than they were at the peak of the last cycle. Do banks need reserves to lend? The mainstream view is that reserves are deposits that haven’t been lend yet. I am away from my office at present and so cannot access any textbooks to quote from. But all the standard macroeoconomics textbooks (Mankiw included) will speak in those terms. However we need to get a few things straight. First, banks do not lend reserves! What? Banks do not lend reserves. So what is the role of bank reserves? The commercial banks are required to keep reserve accounts at the central bank. These reserves are liabilities of the central bank and function to ensure the payments (or settlements) system functions smoothly. That system relates to the millions of transactions that occur daily between banks as cheques are tendered by citizens and firms and more. Without a coherent system of reserves, banks could easily find themselves unable to fund another bank’s demands relating to cheques drawn on customer accounts for example. Depending on the insitutional arrangements (which relate to timing), all central banks stand by to provide any reserves that are required by the system to ensure that all the payments settle. The central bank charges a rate on their lending in this case which may penalise banks that continually draw on the so-called “discount window”. Banks thus will have a reserve management area within their organisations to monitor on a daily basis their status and to seek ways to minimise the costs of maintaining the reserves that are necessary to ensure a smooth payments system. The interbank market (say the federal funds market in the US) functions to shuffle the reserve balances that the member (private) banks keep with the central bank to ensure that each of these banks can meet their reserve targets which might be simply zero balances at the end of the “day”. I have put “day” in inverted commas because we should think that the central bank polices its reserve requirements per day. They requirements are usually expressed over some period of weeks rather than days and are averages. But that is a complication we can avoid here. So we might qualify the statement that banks do not lend reserves. In a sense, they can trade them between themselves on a commercial basis but in doing so cannot increase or reduce the volume of reserves in the system. Only government-non-government transactions (which in MMT are termed vertical transactions) can change the net reserve position. All transactions between non-government entities net to zero (and so cannot alter the volume of overall reserves). I explain that in more detail including the implications of that point in the trilogy of blogs – Deficit spending 101 – Part 1 – Deficit spending 101 – Part 2 – Deficit spending 101 – Part 3. It helps to understand why budget deficits place downward pressure on interest rates – which is contrary to the mainstream macroeconomics textbook depiction captured by “crowding out”. The important point for today though is that when a bank originates a loan to a firm or a household it is not lending reserves. Bank lending is not easier if there are more reserves just as it is not harder if there are less. Bank reserves do not fund money creation in the way that the money multiplier and fractional-reserve deposit story has it. MMT notes that bank loans create deposits not the other way around. Reserve balances have nothing to do with this – they are part of the banking system that ensure financial stability. These loans are made independent of their reserve positions. So while the bank organisation will include a reserve management division it also will have a loan division. The two are functionally separate and the latter does not correspond with the former prior to making loans to appropriate credit-worthy customers. Depending on the way the central bank accounts for commercial bank reserves, the banks will seek funds to ensure they have the required reserves in the relevant accounting period. They can borrow from each other in the interbank market but if the system overall is short of reserves these “horizontal” transactions will not add the required reserves. In these cases, the bank will sell bonds back to the central bank or borrow outright through the device called the “discount window”. There is typically a penalty for using this source of funds. So it is quite wrong to assume that the central bank can influence the capacity of banks to expand credit by adding more reserves into the system. Please read the following blogs – Building bank reserves will not expand credit – for further discussion on this point. If “economic activity is too slow” then the central bank can do very little to expand private credit other than to cut interest rates. The availability of reserves will not increase bank lending. This is the old fashioned money multiplier version of banking where there the “money supply” is some multiple of the monetary base (provided by the central bank). By manipulating this “multiple” the mainstream economists claim, erroneously, that the central bank can control the money supply. That is absolutely wrong. The obvious way a bank which is sitting on its requirement capital ratio can expand its capacity to lend is to increase its capital. Banks are capital constrained not reserve constrained. Please read my blog – Lending is capital- not reserve-constrained – for more discussion on this point. So what role do bank deposits play? How does this relate to the MMT claim that loans are just created from nowhere? Think about what happens when you go to the bank and ask for credit. This is happening every hour of every business day as households and firms seek credit. The loan is a bank liability which can be used by the borrower to fund spending. When spending occurs (say a cheque is written for a new car), then the adjustment appears in the reserve account the the bank that the cheque is drawn on holds with the central bank. Does the bank’s reserve fall as a consequence? Not necessarily because it depends on other transactions. What happens if the car dealer also banks with Bank A (the consumer’s bank)? Then Bank A just runs a contra accounting adjustment (debit the borrower’s loan account; credit the car dealer’s cash account) and the reserve balance doesn’t change even though a settlement has taken place. There are more complicated situations where the reserve balance of Bank A is not implicated. These relate to private wholesale payments systems which come to the settlements system (aka the “clearing house”) at the end of the day and determine a “net position” for each bank. If Bank A has more cheques overall written for it than against it then its net reserve position will be in surplus. What does that all mean? Loans are not funded by reserves balances nor are deposits required to add to reserves before a bank can lend. This does not deny that banks still require funds in order to operate. They still need to ensure they have reserves. It just means that they do not need reserves before they lend. So the profitability of the loan desk is influenced by what they can lend at relative to the costs of the funds they ultimately have to get to satisfy settlement. So the price that the bank has to pay for deposits (one source of such funds) impact on the profitability of its lending decisions. As noted in the introduction, at the height of the crisis, as wholesale debt funding sources became more expensive, the commercial banks in Australia turned to a greater reliance on fixed term deposits. The rate they were prepared to pay on these deposits also rose as competition for them increased. Domestically-sourced deposits are usually cheaper seeking funds on money markets and/or the central bank. You might like to read this article from the March 2011 Reserve Bank of Australia Bulletin – The Effects of Funding Costs and Risk on Banks’ Lending Rates – which explains some of this in more practical terms. To demonstrate that point the following graph (Graph 1 from the March 2011 RBA Bulletin) shows the different funding sources used by Australian banks before the crisis and in January 2011 as proportions of total funds. You may also like to read this September 2010 RBA Bulletin article – Australian Bank Capital and the Regulatory Framework – which explains how capital constraints limit the size of the loans a bank can issue and how banks in Australia reacted to the financial crisis. I hope that has answered all those queries which sought to integrate an undertanding of how loans create deposits with the role that deposits play in the funding of bank operations. Deposits do not fund loans. But they are one source of funds that the bank has available to ensure that its role in the settlement process is not compromised which would require borrowing from the central bank. Banks have no operational constraints on their lending which is not the same thing as saying they do not face constraints that arise from profitability considerations. so, when banks borrow from CB, there is an increase of reserves? but they can use also mortgage bonds? I mean, they use the same bond that the customer give to the bank? Yes. This is a vertical transaction (the central bank is part of the government). Most other important components of the economy were weak or even going backwards in the March quarter or in the month of April. Is any amount of mining investment really enough to provide a solid basis for growth given how small a part of the economy it really is? Much of the capital expenditure will be in machinery which – to my knowledge – is nearly all imported, not manufactured here. Even plant components seem to be increasingly imported – there’s an industrial row brewing here in Gladstone after a worker at one of the alumina plants narrowly escaped death but received horrific injuries which have resulted in the amputation of both legs after imported structural supports being added to a new part of the plant broke and collapsed. Imported capital surely subtracts from the equation more than it adds to it? Mining is running harder and faster than ever at present and prices for our dirt have never been higher but the economy appears to be steadily winding down rather than up – I’m just not seeing any evidence that any great amount of revenue generated by mining flows on to the rest of the economy. Regardless, I bet this gives the RBA a reason to hike next week. Thanks Bill. This is a very important topic. I have a question that I don’t think this blog answered. Are all reserves kept at the central bank then? And this allows for smoother daily transactions? Again I would like to pick on words a bit. Bill you say: “The loan is a bank liability which can be used by the borrower to fund spending.”. From what I learned from this very blog, wouldn’t it be better to say: “The loan contract is the bank’s asset, and the corresponding deposit is a liability which can be used….”? Yes, by definition, private bank reserves are electronic entries in a certain computer file, owned (or at least operated by) the CB. Bill, can you explain why banks have to borrow funds from wholesale markets, exposing them to exchange rate fluctuations and greater risk, and presumably at higher cost? I understand that deposits alone aren’t sufficient, but can’t the central bank make further funds available to the banks in a fiat currency monetary system? I agree that the sentence structure is a little loose, but the intent seems clear enough. I think you are correct when you observe that, from the bank’s point of view, its loans are assets. But “bank liability” could also be understood to mean “liability *to* the bank.” No? The sheer volume of cogent, well=written material we get here never ceases to amaze me. The way banks operate is known by bankers and can be observed by non-bankers. In other words it is not a matter of it being a theory, it is an observable fact. So why is it then that economics even gets this basic operation wrong? …and surely someone employed as a bank economist would know that his/her employer operates contrary to his/her economic belief system? My question then is it possible for the central bank to somehow “default” by having too many of these “liabilities” or at least do these “liabilities” at all hurt the central bank or it’s balance sheet? To call them liabilities technically is true but they are not really liabilities in the normal, functional sense for the CB are they? thank you again and be well. JP: I’m pretty sure that a bank’s vault cash is counted as part of its reserves. Peter: The sentence is correct as written. The loan is a liability *to the borrower* that s/he can use to fund purchases. If I get a loan from the bank, that is my liability (the bank’s asset); I can then use the loan (liability) to buy a car. So both assets and liabilities (deposits and loans) held by a person at a bank can be used to fund purchases. Hope that clears it up (and is correct). Josh, the problem is that “loan” and other words are used ambiguously, and one has to use the right interpretation to make the sentence correct. Something any writer & reader must do constantly, or be too pedantic even for me. Peter just disambiguated Bill for clarity. It is only the deposit (bank liability, household asset) the bank gives you in return for the loan (bank asset, household liability) that one can use to buy a car. Using the wrong meanings can have humorous results. Only your household assets, not your household liabilities, can be used to fund purchases. I don’t get it. I Have reserves of 10 and I make a loan out of thin air of 50. The borrower gets a deposit with me of 50, but then withdraws that deposit to spend it , that is why he borrowed. If I am unlucky ALL the money after being spent is deposited in other banks, who present me with demands for 50 and all I have is 10 – darn I have sell that loan to survive, so it was pointless. Seems to me I am constrained by my reserve. Maybe some of the 50 loan will be redeposited with me but I can’t bet on it. It will do because you have forgotten that you have an account with the central bank, and access to the ‘lender of last resort’. Use the discount window Luke. It seems then that the entire monetary system rests on the premise that the commercial banks will always record the deposit amount and the corresponding liability amount in their books correctly, and report such to the CB? If so, surely there is incentive for the commercial banks to commit fraud by making the deposit and not reporting the liability to the CB, then no need to pay the CB for the money?